Wearing a wedding dress and tuxedo over their wet suits, the couple exchanged rings, kissed, and had a video recorded of them swimming in the beautiful sea. Because both the bride and groom love marine sports and have been diving in the sea off many different countries, they decided to have their marriage ceremony in the beautiful ocean. After gathering information about underwater marriage ceremony options all over the world through the Internet, they thought that the underwater wedding plan in Okinawa looked the best. Wong studied Japanese for a year at Doshisha University in Kyoto, but she had never seen the ocean around Okinawa. “It was a little cold but very nice in the water. This summer we will invite between 200 and 300 people to our wedding reception in Macao. 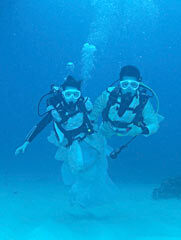 I would like to show them our underwater marriage ceremony,” she said with a smile.